The sensor's stainless steel housing provides an environmentally rugged unit, while the epoxy seal offers protection against industrial environments. Its grounded case construction provides tight mechanical coupling which yields accurate, wideband shock and vibration data. 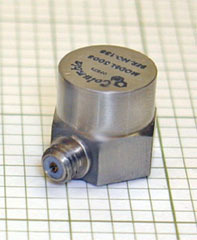 These accelerometers feature a 10-32 side connector and are provided with a 10" lownoise coaxial cable. High temperature units will operate in environments up to +500 Deg. F.